Hi! I am Michelle Lynott, I live in Northeast Pennsylvania with my son in a small town just south of Scranton. For years, I worked in restaurants. I enjoyed it, but helping others plan time with family making life long memories has offered me a much happier career! Walt Disney World – I have been traveling to Walt Disney World since I was a child with my parents. In college I took time off visiting Disney for London and Amsterdam. I have visited New York City, Philadelphia, Washington DC, Nashville, and Dallas Texas for weekend trips. I started vacationing at Walt Disney World with my son when he was four. We have been back at least once every year since. We have always stayed on site, at different category resorts every visit including Pop Century, Art of Animation, All Star Movies, and Sports, Coronado Springs, The Contemporary Resort, Animal Kingdom Lodge and The Treehouses at Disney’s Saratoga Springs: Experiences – International Flower and Garden Festival, International Food and Wine Festival, Mickey’s Not So Scary Halloween Party, Mickey’s Very Merry Christmas Party, dessert parties, Pirate and Pals Fireworks Voyage, Pirates League, Caring for Giants Tour at Animal Kingdom and planning a Wild Africa Trek Tour at Animal Kingdom later this summer (2018) . 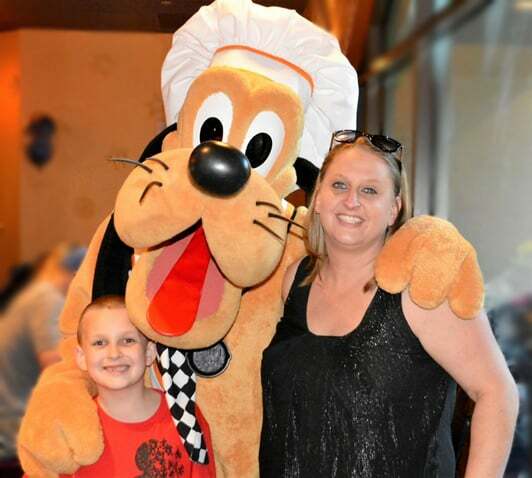 Disney Cruise Line – Silver Castaway Club Member, completing the “Grand Slam” by sailing on all four Disney Cruise Line ships, my favorite being the Disney Fantasy. I have sailed 3, 4, 5 and 7 night Bahamian and Caribbean itineraries out of Port Canaveral and Port Miami. We are currently planning an Alaskan sailing in summer 2019! While sailing we have done various excursions including swimming with stingrays, swimming with sea turtles, visiting limestone caves, various resort beach days, parasailing and spent a day at Atlantis, Paradise Island in the Bahamas. I have also attended the Royal Tea on the Disney Fantasy, which is such a unique character experience and every princess will love! Disneyland – I have traveled to the Disneyland Resort and Disney California Adventure for the unofficial Star Wars Day Celebration on May 4th, staying on site at Disney’s Paradise Pier. Universal Studios – I have been lucky enough to visit Universal Studios in Hollywood and Universal Studios Orlando Resort staying on Site at the Hard Rock Hotel.